A beautiful, low maintenance garden is the real icing on the cake for your home, framing both the exterior view of your home and bringing your outdoor spaces to life. According to Jindee's landscape architect Tony Blackwell from Blackwell & Associates, Jindee is all about embracing outdoor living and enjoying our amazing location so you need the garden to match. 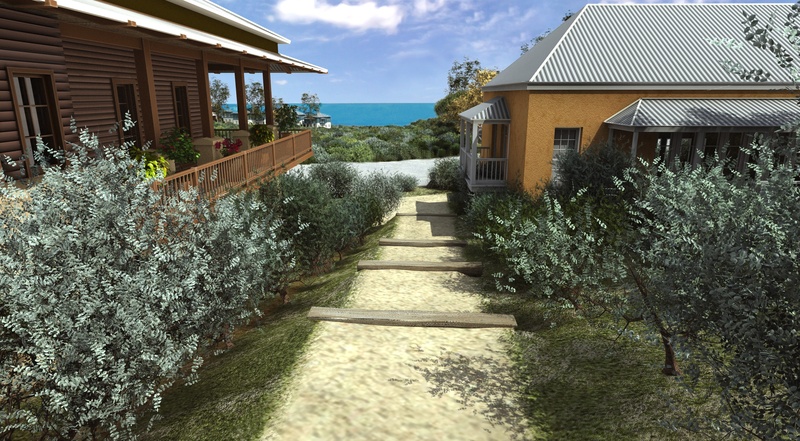 Throughout Jindee's landscaping, among the key considerations for landscaping within the public spaces is the expected uses within the particular transect zone, which influences the need for shade and protection from the elements. Similarly, Blackwell said that when planning your own garden, one of the most important considerations is how you will actually be using it. "The first thing you need to ask yourself about is “what is the purpose of the garden?”. Is it something just to look out from inside? Somewhere to have a coffee or read a book? Or somewhere you will do some serious entertaining?" he said. "This will raise a number of questions such as how much paved area you need for walkways, furniture and maybe a barbeque, compared to the area you need for planting, lawn or even a pool." Think also of the time you have to maintain your garden and the amount of water required. Whether you are working with a landscaper or attempting a DIY, it is all about knowing which species are going to work best in your garden. Blackwell said that the plants that will suit your space best largely depend upon the area you have available. "Think about the mature size of the plants and locate them accordingly. Generally it is best to have low ground-covers close to the edge of paths and set larger shrubs and trees further back - which also create a natural wind-break and adds to the sense of depth in your garden. Provide enough space for trees so they will not cause damage as they grow," he said. "Also consider plants that will thrive in coastal conditions - native coastal plants are likely to be best adapted and the most water efficient." "When choosing plant species it’s often a good idea to go and look around neighbouring suburbs to see what is growing in similar positions to your home - such as distance to the coast and exposure to salt-laden winds," Blackwell said. By picking plants that can withstand the coastal conditions, thrive in the hot Aussie sun and boast dense, colourful and hardy foliage, you can have a beautiful garden for years to come. Banksia integrifolia. These fast growing plants will give you beautiful greens, silvers and flowers of pale yellow and are hardy in both salty and windy conditions - win-win! Westringia fruticosa. Another sturdy option that can cope with the salty air, these beautiful plants can be shaped into a sphere if that is your style and have stunning fine leaves with small white flowers. Succulents for ground-cover. Adding texture, hardy succulents can withstand salt-spray as well as dry periods. As with the interior of your home, consistency is key. Blackwell advises choosing a theme and adhering to it, avoiding picking and choosing bits and pieces that won’t necessarily all fit together. A great place to get some initial inspiration is Pinterest. Borrowed landscape can be your new best friend, particularly if you have a small garden. This simply means taking advantage of the views, plants, trees and other natural features surrounding your property and incorporating into planning your own garden. All of Jindee's streets are lined with trees specifically chosen to provide optimal shade - these are the perfect example of borrowed landscape which will add both character and shade to the homes within the estate. Read more about this here. When planning your garden, think about other things that will make it feel distinctly 'you'. Maybe this is in your plant selection, or the paving type and detailing. You could go beyond this in terms of unique artworks, bird baths or water features. To add a beach vibe, consider using natural materials. Limestone blocks for retaining walls, wooden decking or crushed seashell pathways are all examples of using materials that complement your seaside location. By applying all of these principles, as well as of course adding your own individual style, you can create a low maintenance garden that draws on the relaxed vibe of the beach.